Humax FVP-4000T review | What Hi-Fi? In the olden days you watched whatever was on television. If you didn’t want to do that, you either watched regardless or left the room. The Humax FVP-4000T is the opposite of that. It’s a Freeview Play box, which means, as well as accessing the usual catch-up services via their apps, you can scroll through the television guide to watch anything you missed in the past seven days. Catch up made easy is how it’s described, and, at least in theory, it’s difficult to argue otherwise. For those more forward-thinking viewers, or those without internet, you can also rummage forward though the programme list and schedule recordings – up to four at once, while watching a fifth – to fill your 500GB (around 300 hours standard definition recording) or 1TB (around 600 hours) hard drive. 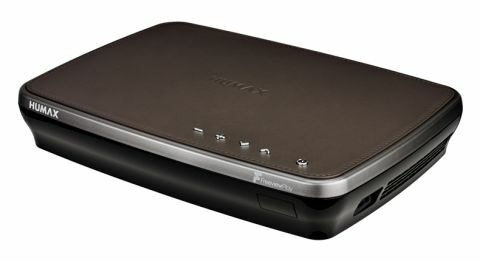 Elsewhere, it can play content – video, music or photo slideshows – via USB, any storage device connected to your home network or, with Humax’s live streaming app, wirelessly via a phone or tablet. It’s a fairly comprehensive home entertainment hub, also benefitting from Dolby Digital Plus for those with surround sound. In the box we find a stylish product. Ours is the Mocha version, a black box with brown faux-leather surface and silver trim, while the Cappuccino is identical but for white plastic and gold trim. Equally suave is the remote control. Black but for a rather retro brushed metal plate set behind the numbers, it’s lightweight but quite adequate with its well-sized buttons. Alternatively, you might want to load your phone or tablet with the Humax apps; an intuitive remote control app and one for setting recordings remotely as well as the live streaming app previously mentioned. Setting up is straightforward: simply plug in the power, television aerial, HDMI to your TV (and, if your wi-fi signal is often questionable, ethernet cable) and follow the on-screen prompts. After a software update ­– Humax promises on its website that more are en route to include streaming services such as Netflix – we’re under way. We’ve no complaints about the picture quality. Watching the Masters snooker, for example, there’s plenty of detail to distinguish the greys in Ronnie O’Sullivan’s once exclusively dark hair, and the colour of the balls against the baize is vibrant but natural. We’ve no trouble distinguishing reds from the brown or pink, for example, as can be the case with a poorly adjusted palette. As the Rocket lives up to his nickname, progressing rapidly round the table, there are no issues tracking him or the restless cue ball. Effectively, it won’t hold back your TV set, and you can’t say fairer than that. The same applies to sound quality: there is fine expression in voices and decent musicality that we feel lacks nothing in comparison with our telly’s native sound. Perhaps most importantly, it’s easy to navigate; despite it being different to any interface we’re used to from Humax. Even disregarding any shortcuts, everything is accessible via the blue ‘home’ button on your remote, including a handy tab for recently watched channels. We encounter no problems accessing apps, recording or watching shows back, and find all to be satisfyingly swift and reactive. In short, we’d have no problem using the FVP-4000T at home. It looks good, physically and on screen, and is a fine route to catching everything you want to see on Freeview HD. We aren’t discouraged by the lack of apps such as Netflix, given the range of connections and promise of its presence in the future. If Freeview Play is your bag, this could well be the box to deliver it.